Most molecules are at peace with themselves. Bottles of water, or acetone (propanone, Me2C=O), or methyl iodide (iodomethane CH3I) can be stored for years without any change in the chemical composition of the molecules inside. Yet when we add chemical reagents, say, HCl to water, sodium cyanide (NaCN) to acetone, or sodium hydroxide to methyl iodide, chemical reactions occur. To understand organic chemistry you must be familiar with two languages. One, is the structure and representation of molecules. The second is the description of the reaction mechanism in terms of curly arrows and that is what we are about to start. The first is static and the second dynamic. The creation of new molecules is the special concern of chemistry and an interest in the mechanism of chemical reactions is the special concern of organic chemistry. All organic molecules have an outer layer of many electrons, which occupy filled orbitals, bonding and nonbonding. Charge–charge repulsion between these electrons ensures that all molecules repel each other. Reaction will occur only if the molecules are given enough energy (the activation energy for the reaction) for the molecules to pass the repulsion and get close enough to each other. If two molecules lack the required activation energy, they will simply collide, each bouncing off the electrons on the surface of the other and exchanging energy as they do so, but remain chemically unchanged. This is rather like a collision in snooker or pool. Both balls are unchanged afterwards but are moving in different directions at new velocities. Organic reactions are the chemical reactions involving the organic compounds. The basic organic reaction types are addition reactions, elimination reactions, substitution reactions, redox reactions, rearrangement reactions, photochemical reactions and pericyclic reactions. 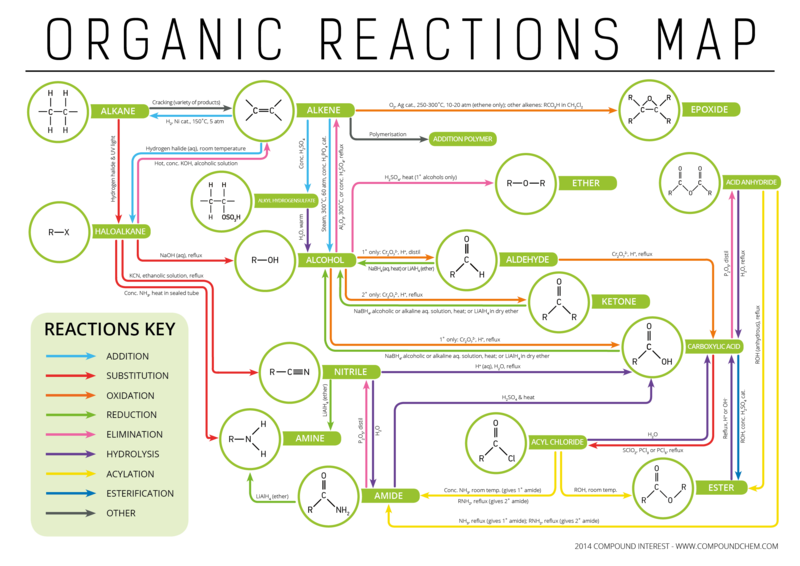 Here we’re going to share an infographic from Compound Interest, in this infographic functional groups interconversions of the following organic functional groups is shown by addition reactions, substitution reactions, oxidation reactions, reduction reactions, elimination reactions, hydrolysis, acylation and esterification.